Leona Morgan speaking at Dine' CARE's Peoples Convention on Saturday. Photo two: Earl Tulley, Dine' CARE, joins Leona at presentation in Dilkon on Navajo Nation..
DILKON, Navajo Nation -- Leona Morgan, Dine', has spent her life fighting uranium mining and hauling and nuclear dumping. Now, the U.S. is targeting the poor people of southern New Mexico with nuclear dumping, and in northern New Mexico, uranium mining again threatens the Navajos Sacred Mountain of Mount Taylor. "We are fighting all of it," Leona said at Dine' CARE's Western Peoples Convention on Saturday. The most vulnerable are the unborn children. 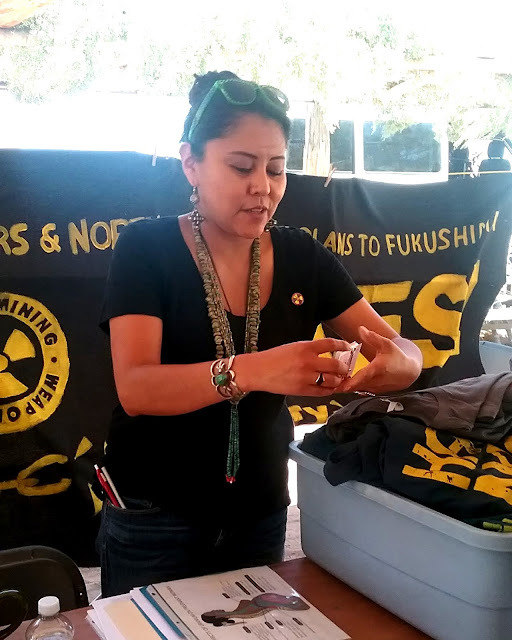 Leona became involved when a proposed uranium mine in Church Rock, N.M., bordering Navajo communities, planned to take the ore for processing to near her parents community in Crownpoint in 2007. After a long struggle, the mining project by Uranium Resources, Inc., was halted in 2014. "The United States calls it the nuclear fuel cycle," Leona said, referring to the sanitized words that the United States uses for the deadly cycle. "We are at the front end," she said of Navajo communities. Leona described how uranium mining and milling results in weapons and nuclear development. Leona said the goal of U.S. colonialism is to control the rest of the world. Meanwhile, much of the nuclear waste from the weapons and depleted uranium comes to New Mexico. Among the most deadly is irradiated fuel, or spent fuel. It is high level radioactive waste. "They want to bring all of the nuclear waste to New Mexico," she said. Today, Leona is working with the Nuclear Issues Study Group in Albuquerque, and Haul No! based in Flagstaff. Energy Fuels is proposing to take ore out in the Grand Canyon, and drive it through Flagstaff and across the Navajo Nation, to the mill in Ute country, White Mesa Mill. 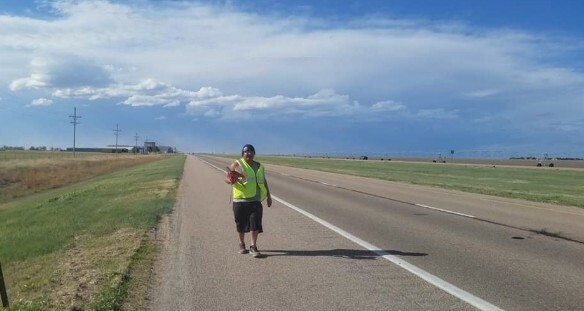 Leona said the Navajo Nation has laws to prevent the transport on their lands, but the laws do not apply to U.S. highways and railways, which leaves Dine' and their communities unprotected. "We have a law against the transport of radioactive materials." Searching for a remedy, Leona joined others and went to the Navajo Nation's Department of Justice. However, the response was this, "It is off our radar, and we can't do anything about it." After realizing the Navajo Nation wasn't going to do anything about it, Leona joined others and went to the communities. People got involved, and chapters passed resolutions. The City of Flagstaff passed a memorial, but once again, there was the realization that U.S. laws supersede local laws. "They did pass a resolution, which is really great," Leona said of the Flagstaff City Council. Then, good news followed. Three weeks ago the uranium mining company pulled out most of its workers and declared a moratorium on the work in the Grand Canyon. Along with the resistance, Leona said the price of uranium is really low now. At White Mesa Mill they are storing dirty nuclear waste. "They burn waste at 2 o'clock in the morning." Leona is also working with the Radiation Monitoring Project. Haul No! will host a training at the end of October, including training with Geiger counters. With radioactive tailings still scattered on the Navajo Nation from uranium mining decades ago, the Geiger counters can be borrowed and used by community members as they choose, to detect radioactivity. Leona points out that the radiation is most harmful to the most vulnerable -- to the unborn child. Leona said even the laws that control radioactivity in the United States are racist. These laws are based on how it will affect a 35 year old white male. Now, in New Mexico, communities are being threatened by a mine that has been on stand by status. Rio Grande Resources extracted ore in the 70s and 80s near Grants in northwest New Mexico. The mine is open, spreading contamination, and hasn't been cleaned up. In Grants, some people want this mine to start up again. Leona said that they think this will bring back a heyday of uranium mining. They believe it is good for economy. "We know it is bad for the environment." The mine has been allowed to go back to active status. This mine needs to be cleaned up near Mount Taylor, sacred to Navajos. Leona joined others at hearings, and told the State of New Mexico this mine needs to be cleaned up. With no place to store high level nuclear waste, the United States developed the Consolidated Interim Storage nuclear law. "Western Shoshone are the most bombed nation on the planet," Leona pointed out, referring to the Nuclear Test Site on their ancestral lands in Nevada. The United States has no place to put its high level radioactive nuclear waste, so they are trying to build an interim place. "They want to bring it to New Mexico," Leona said, describing the two sites near Carlsbad in southern New Mexico. Now with applications to store enormous amounts of high level nuclear waste, two companies have applications for 40 years near Carlsbad, and the time span can be expanded. "We are concerned that this is going to be a permanent dump." The transport of this high level, radioactive nuclear waste would go through the Navajo Nation on the railway. Currently, the Nuclear Issues Study Group is hard at work, gathering signatures in the communities to oppose this. They are going to the flea market in Gallup and elsewhere to gather signatures and inform residents. Recently, those opposing this dangerous nuclear dump crashed the site tour and the Sheriffs kept them away. The U.S. wants to dump the nuclear waste in New Mexico, waste that is the result of creating electricity for other people globally. And when these dangerous nuclear dumps encounter problems, it will be the U.S. tax payers who pay the costs. 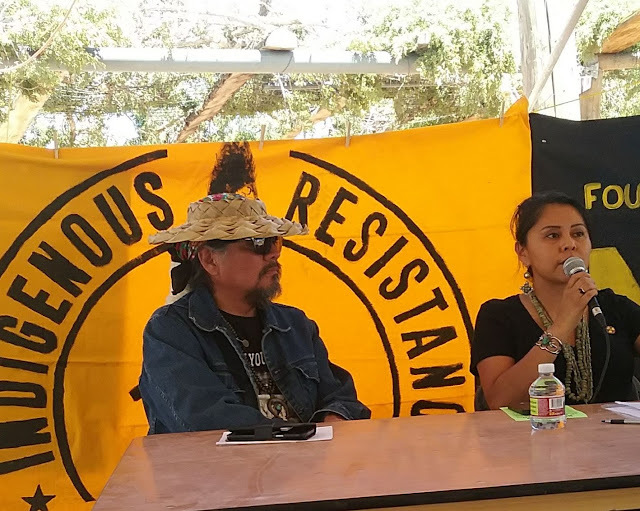 Leona closed her talk by pointing out that Tetra Tech has already been exposed for violations and a botched cleanup at Hunters Point Naval Shipyard in California, and should not have been granted a radiation contract on the Navajo Nation. Leona was among the speakers at the Dine' Citizens Against Ruining Our Environment's Western Peoples Convention, June 1 --3, 2018, in Dilkon on the Navajo Nation. Holtec International wants to create a dump for supposedly “interim” storage of the nation’s deadliest high-level radioactive waste at a site between Hobbs and Carlsbad, N.M. The waste is unlikely to move again since there would no longer be political will to create a permanent repository or to find funding to do so. The company plans to transport 10,000 canisters of irradiated reactor fuel rods from around the country and store them slightly underground and partly above the surface in New Mexico. This is more waste than all U.S. nuclear reactors have produced to date. The U.S. Environmental Protection Agency awarded Tetra Tech Inc. a contract worth $85 million to assess abandoned uranium mines on the Navajo Nation, the Gallup Independent reported in Oct. of 2017. "Tetra Tech, headquartered in Pasadena, California, will assess uranium contamination at 30 abandoned mine sites in and around the Navajo Nation. A portion of funding for the contract comes from a $1 billion settlement reached in 2015 for the cleanup of more than 50 abandoned uranium mines for which Kerr McGee Corp. and its successor, Tronox, have responsibility." 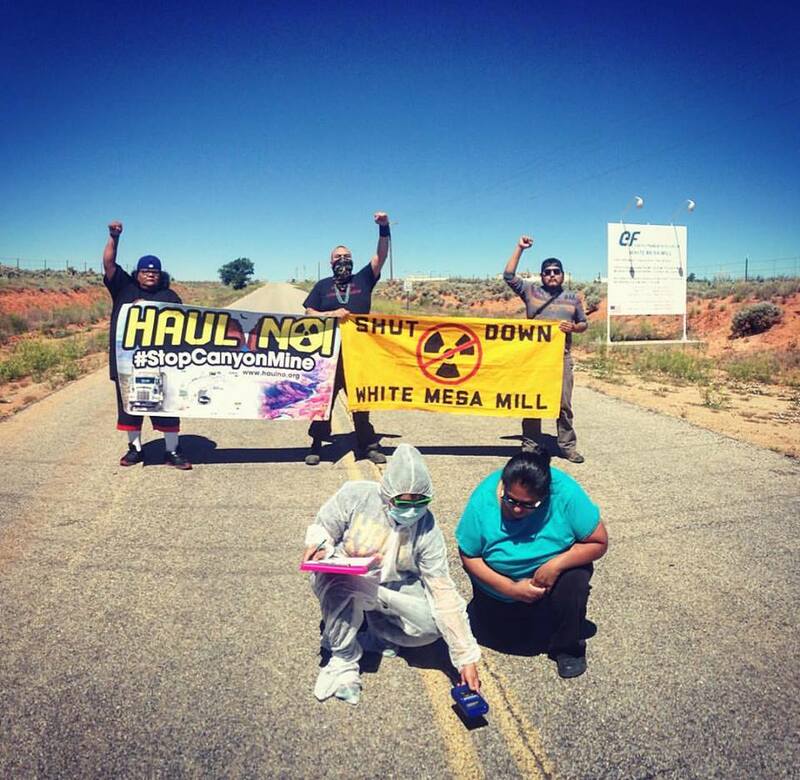 Two imprisoned for botched Tetra Tech cleanup in Calif.
CARLSBAD, NM – Concerned members of New Mexico communities, including local Hobbs residents, attempted to attend a government site visit Wednesday, May 2, of a proposed high-level nuclear waste dump in New Mexico. The Nuclear Regulatory Commission (NRC), Holtec International, and the Eddy-Lea Energy Alliance (ELEA) held a closed meeting Wednesday without informing or inviting the public, violating its own Public Participation Policy. The next day, NRC hosted a public meeting where it delayed speakers who opposed the site until last and gave them less time to speak. NRC’s 10-day advance-notification policy, which involves posting a notice of a meeting between a license applicant and the NRC, was not observed for Wednesday’s site tour. In addition, even with the provisions to give fewer than 10 days if the 10-day rule cannot be observed, nothing was posted on NRC’s website. They also failed to cite any reason for not including the public, such as trade secrets or exchange of proprietary info. On Wednesday, more than 10 members of the public arrived just before the scheduled 1 p.m. tour at the site along County Road 55, just north of U.S. Highway 180 between Carlsbad and Hobbs. Eddy and Lea County Sheriff’s officers informed the group that they were directed by tour organizers to keep the community members from attending the site tour, keeping them to the county road alongside the Holtec site. In addition to being excluded from the site visit, the final scheduled NRC Public Scoping meeting in Carlsbad, held on May 3, demonstrated discrimination against opponents of Holtec’s waste site by giving them less time to speak. In addition, the order of speakers was not consistent with when speakers arrived or signed up to speak. The NRC facilitator, Francis “Chip” Cameron, called on elected officials first, many of whom are proponents of the project representing the Eddy-Lea Energy Alliance, as well as a Holtec staffer. Most residents who had spoken at the previous two meetings opposed the site. At the tail end of the meeting were a string of speakers from the public who all opposed the Holtec project in their statements. The facilitator told those who remained to make their comments shorter than previous speakers, and cut off Artesia resident Noel Marquez from finishing his prepared statement at a fraction of the time given to previous speakers. Marquez started his statement in Spanish and continued in English, “It’s no wonder our communities hesitate to come to these badly designed meetings over two hours long and limited to a very short statement on such an extremely important issue, all while our lives are at stake.” After Marquez was abruptly cut off, audience members demanded the facilitator give Marquez one more minute to be allowed equal time as earlier supporters of the waste dump were given. The volunteer-run Nuclear Issues Study Group has been working to inform residents statewide about the proposed radioactive-waste dump and the issues of illegality absent a change in the current Nuclear Waste Policy Act, which clearly states that a Consolidated Interim Storage Facility cannot be licensed until a permanent repository is open and running. NISG is not only educating the public about this little-known proposal, but collecting letters to the NRC from people who oppose this project and call for better solutions, protection of health and environment for future generations, and additional meetings in their communities. At this same Carlsbad public meeting, Nuclear Issues Study Group Co-coordinator Leona Morgan handed to the NRC 1,303 letters signed by individuals who oppose the proposed waste dump. Most of the letters were signed by those who had no prior knowledge of the proposed dump or that high-level radioactive waste may be transported through their communities. Additionally, the majority of signers did not have access to the three meetings being held in southeastern New Mexico, for lack of public notice or transportation to these meetings. One local Carlsbad resident said to the NRC, “I guarantee if you went around Carlsbad and talked to 20 people, not one of them would know about this project. This has been under the radar for a long time.” Another speaker informed NRC there are many people who do not own cars who would be there, but cannot for lack of mass public transport in that area. The NRC Public Comment Period for scoping comments ends on May 29. Article copyright Brenda Norrell, may not be republished without permission, or used to gain revenues.